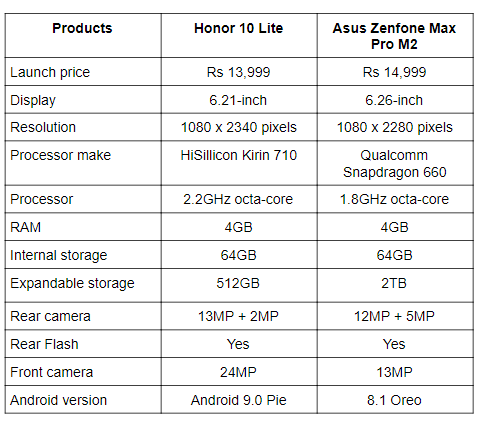 Today, we are comparing Honor’s latest device Honor 10 Lite with one of the most popular devices of the mid-range segment Asus Zenfone Max Pro M2. The Honor 10 Lite has recently launched in India and is priced at Rs 13,999. The phone is powered by a Kirin 710 chipset and features a 6.21 FHD+ display. On the other hand, we have the Asus Zenfone Max Pro M2, which comes with a 6.26-inch FHD+ display and is backed by a Qualcomm Snapdragon 660 processor. So, let’s do a complete specification comparison of the two to know which one would be the best buy when it comes to hardware. As you can see above, the Honor 10 Lite sports a 6.21-inch FHD+ display that offers a resolution of 1080 x 2340 pixels. On the other side, the Asus Zenfone Max Pro M2 features a slightly bigger 6.26-inch display that offers a resolution of 1080 x 2280 pixels. Coming to the processor, the Honor 10 Lite is powered by a Kirin 710 chipset, while the Asus Zenfone Max Pro M2 is backed by a Qualcomm Snapdragon 660 processor, which is paired with 4GB RAM and 64GB internal memory. Same as the Asus Zenfone Max Pro M2, the Honor 10 Lite also packs 4GB RAM and 64GB internal memory. As far as the cameras are concerned, the Honor 10 Lite has a dual 13MP + 2MP camera set up at the back along with a 24MP sensor on the front. The Asus Zenfone Max Pro M2 also has a dual 12MP + 5MP rear cameras that comes with a 13MP unit on the front. 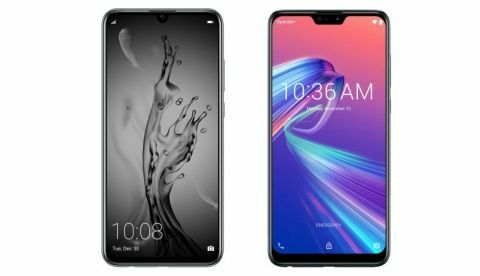 The Honor 10 Lite is available in India for Rs 13,999, while you can get the Asus Zenfone Max Pro M2 4GB variant for Rs 14,999.